Plastocon has been designing and manufacturing quality plastic products from Oconomowoc, WI for over 50 years. That kind of experience is what sets our products apart. Our Super Max Insulator Trays are legendary in the correctional market, having proven to be top performers when used in the toughest environments. We are proud to say we build a better, longer lasting tray! Our food service trays are specially designed for safe use in correctional facilities. Matching flatware, mugs, tumblers, and bowls are also available for a complete meal delivery system. The Plastocon line of support equipment includes everything from drying racks to security cabinets. Don't see what you're looking for?CONTACT USWe have too many products to list them all online! Plastocon Inc. offers a full range of correctional meal delivery trays, flatware, carts and accessories to facilities across the U.S. We provide tough, durable products to match your correctional facility’s needs. 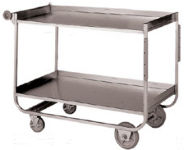 Our extensive line of meal delivery trays and carts will meet all of your toughest standards. No other company offers the selection of meal delivery products Plastocon does. We are an authorized Cambro dealer and can offer you an array of meal delivery solutions based on your specific facility. From plastic cutlery and security knife leashes to mobile steam tables and stainless steel carts; we’ve got it all right here for you, in one convenient stop! Food Service Trays and Support Equipment: If You Want It We’ve Got It! Take a look at some of our products listed online. We have a wide variety of food service trays and accessories for safely serving meals in your correctional facility. Our other products include support equipment for keeping your kitchen and food storage areas secure. If you don’t see what you’re looking for here, please give us a call. We are always working to expand our product line and will do whatever it takes to fulfill your order. We are proud members of the American Jail Association, American Corrections Association and the American Correctional Food Service Association. Our membership gives us a greater understanding of what correctional facilities need. Contact Plastocon now to learn more about our correctional meal delivery equipment or call (800) 966-0103.